The U.S. has upended the global oil and gas market thanks to the domestic shale revolution. We can dominate the clean energy market in the same vein, but to do it we need innovation and a long-term vision. 2018 is the year we can turn the corner. And we have to. Energy is the largest market in the world. Oil and gas is the now. But clean energy, including capturing carbon from fossil production, is the future. And a $1 trillion-plus market the U.S. can lead. China’s booming investment in nuclear, solar, grid-scale storage and other advanced technologies threatens to leave the U.S. far behind in the global clean energy race. 2017 did have its fair share of successes towards growing U.S. clean power leadership. 1. Biggest carbon capture coal plant opens on time and on budget: Petra Nova, the world’s largest post-combustion carbon capture facility, located near Houston, got up and running in January on time and on budget, showing definitively that this technology works. Subsequently, the system reached the “1 million tons of carbon dioxide for use in enhanced oil recovery” milestone in late October. 2. The U.S. recommitted to nuclear power: The Trump administration launched a comprehensive review of policies impacting the sector led by the White House. Both the Office of Nuclear Energy and ARPA-E released advanced nuclear energy funding opportunities. A DOE proposal to the Federal Energy Regulatory Commission was intended to help nuclear earn its true value as one of our most resilient power sources. And the administration stepped in to help secure the future for Georgia Power’s Vogtle plant, which the Georgia Public Service Commission subsequently unanimously decided to continue building. 3. Solar breakthroughs beyond silicon: DOE announced awards to breakthrough Perovskite solar technology, thin solar panels that you can print like newspapers. Having announced success on their 2020 SunShot cost target through silicon panels, DOE is now focusing on a 2030 vision for three-cent solar with next-generation technology like Perovskites, while Republican House energy appropriators encouraged them to focus on this type of breakthrough. Perovskite technology kept up with the hype breaking records for higher efficiency and record stability. 4. 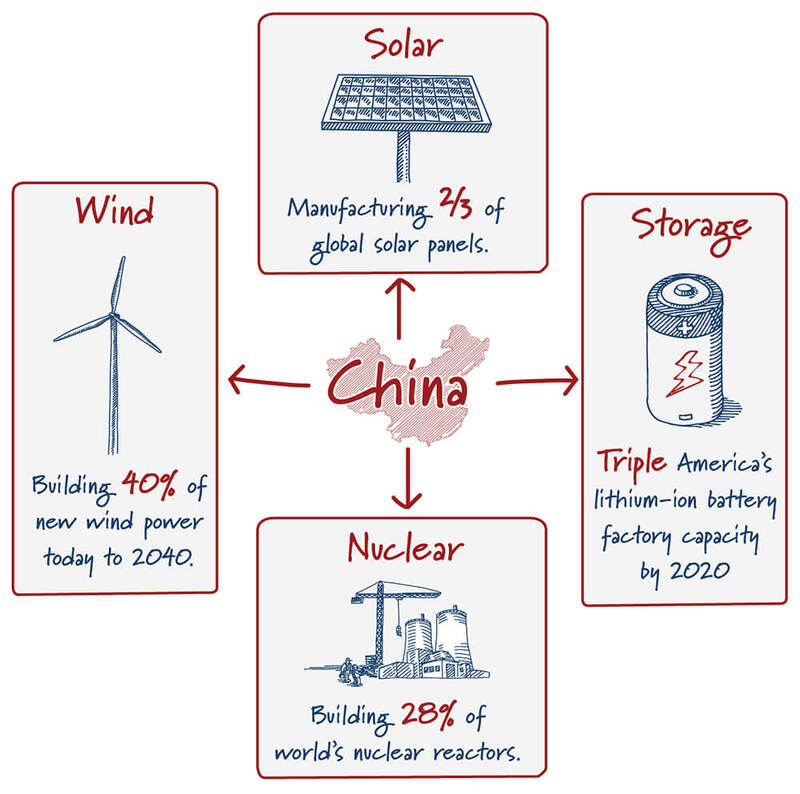 TerraPower and China: One of the most unheralded clean energy developments was China completing a joint venture agreement with the Bill Gates-funded Terrapower to develop a world-first highly advanced nuclear reactor using the spent fuel of other nuclear reactors. The joint venture will build and commercialize a travelling wave reactor, one of the most promising new advanced nuclear technologies. But by stretching its lead in the global clean energy race through such actions as the joint venture with Terrapower, China also underscored how much we in the U.S. need to step up our game this coming year. While the U.S. struggles to build two AP1000 reactors and is closing plants, China is capitalizing on our technologies. They are currently constructing 22 reactors, and have a plan for 136. China is commandeering advanced nuclear technology we never commercialized or have otherwise abandoned. They are about to commission the first high temperature gas reactors in decades globally, and just began construction of their first commercial scale sodium fast reactor. And with Russia and China exporting nuclear tech to Iran and Pakistan, it’s a security risk for the U.S. to abandon the industry, as we have in the last few decades. In short, there is much more to be done. 2. DOE’s budget must refocus on truly revolutionary clean energy technologies, establishing “moonshot” goals for our nation’s laboratories and creating a pathway for the the private sector to develop and commercialize these breakthroughs. 3. NETPower fires up. The 50-MW zero-carbon gas plant in Texas should be running in early 2018. The revolutionary technology uses carbon (rather than steam) to turn the turbine to make electricity, and can cheaply capture all the carbon from coal or gas. If this works as promised, it will be the biggest energy breakthrough since fracking, changing the world and expanding clean energy. 4. 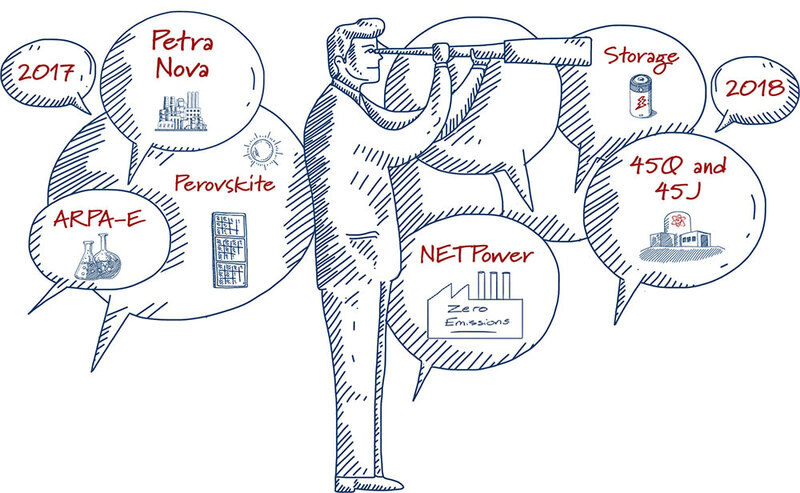 Battery storage starts competing with peaker plants. Falling costs of lithium-ion batteries mean that utilities may soon choose to build a big battery instead of a gas peaker plant, to run on just the highest demand days of the year. Minnesota sees this as economic in a couple more years, while California is seriously considering a battery peaker right now. 2017 may have been merely a crossroads for U.S. global clean energy dominance, but 2018 has the potential to be a truly banner year. With your help, we at ClearPath intend to make that potential a reality.